Yes, there are a lot of supplements in the market that promise women experiencing menopause symptoms the assistance that they need. 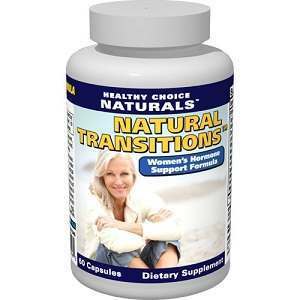 Healthy Choice Natural Transitions help fight back menopause problems and relieve them naturally. Some of the problems that women experience during menopause are: mood swings, irritability, anxiety, fatigue, memory lapses and loss of concentration. It also helps with weight fluctuations and bloating, hot flashes, night sweats and sleeplessness, low libido, vaginal dryness and irregular periods. Black Cohosh – used to help support menopausal symptoms in women. Dong Quai – found to be useful in supporting female cycles. Helps reduce menopausal conditions such as vaginal dryness and hot flashes. Licorice Root – helps with menstrual and menopausal problems and helps increase sexual health. Soy Isoflavones – Relief of hormone based symptoms of menopause like hot flashes. Vitex Berry – has the ability to relieve different kinds of menopausal symptoms. Red Clover – used to fight hormonal imbalances. Sage Extract – manages menopausal symptoms such as hot flashes and night sweats. False Unicorn – reduces menopausal symptoms and used to help maintain hormone levels, helps with irregular menstruation and vaginal discharge. Squaw Vine – helps ease hot flashes and night sweats. Blessed Thistle – is considered a natural remedy for menopause and menstrual cramping. Red Raspberry Extract – stops cramps and helps control menstrual bleeding. Mexican Wild Yam – helps balance menstrual cycle. There are other ingredients in the products such as gelatin, microcrystalline cellulose, vegetable magnesium stearate and silicon dioxide. There are 60 capsules in a bottle and the recommended intake would be 2 capsules daily with a meal. Studies on the product show that best results will be seen after 4 to 5 weeks of use. It is also strongly suggested that one should not take more than 2 capsules a day. The product also has a warning for those who are allergic to soy products. The product also offers a 90-day money back guarantee and customers are asked to return empty bottles for their 100% money back guarantee. Healthy Choice Natural Transition may really be considered as one of the few supplements that would help women with menopause symptoms since it is made of all natural ingredients plus they also offer a 90-day money back guarantee. However, there are different symptoms that the woman experience at different times of the day. Jackie Horowitz	reviewed Healthy Choice Naturals	on May 10th	 and gave it a rating of 2.5.